Most of New Zealand’s more affordable, smaller provincial towns continue to see solid value growth, while Auckland is still seeing a slight drop in value levels. The Hawkes Bay region continues to see some of the strongest rates of growth across the country. Lower North Island provincial areas, such as Manawatu, Masterton and Carterton, are also experiencing strong annual growth rates. Dunedin continues to see the strongest value growth out of the main centres although the Wellington market does remain busy. 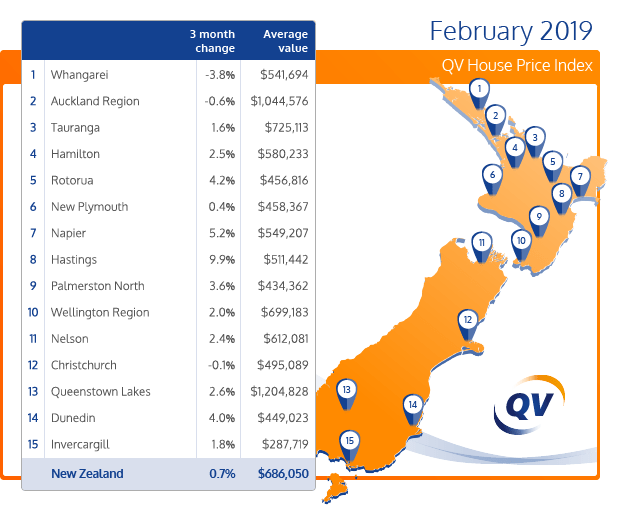 The latest QV House Price Index shows nationwide residential property values have increased steadily over the past year by 3.0% and by 0.7% in the three months to February. The nationwide average value is now $686,050. Meanwhile, residential property value growth across the Auckland Region decreased by 0.9% year on year and by 0.6% over the past quarter. The average value for the Auckland Region is now $1,044,576. Value growth remains slow across Auckland's suburbs. North Shore values dropped 2.0% in the year to February and by 0.7% over the past three months. The average value there is now $1,206,744. The former Auckland City Council central suburbs dropped 0.5% year on year and by the same amount over the past three months and the average value there is now $1,232,811. Waitakere values decreased by 0.8% year on year and by 0.9% over the past three months. Manukau values decreased by 0.7% year on year and by 1.1% over the past three months; Papakura values decreased 0.8% year on year and by 0.3% over the last quarter and the average value there is now $696,415; Franklin values remained flat year on year and Rodney values were up 0.9% year on year. Values across the whole Wellington Region rose 8.6% in the year to February and increased 2.0% over the past quarter and the average value is now $699,183. Wellington City values increased 7.9% year on year and by 2.3% over the past three months and the average value there is now $824,029. Meanwhile, values in Upper Hutt rose 13.9% year on year and 5.7% over the past three months; Lower Hutt rose 9.1% year on year and by 0.4% over the past quarter; Porirua rose 8.1% year on year and by 1.0% over the past quarter. Finally, the Kapiti Coast rose 6.9% year on year and 1.9% over the past three months. Hamilton City home values increased by 2.5% over the past three months and by 5.8% in the year to February. The average value in Hamilton is now $580,233. Tauranga home values rose 2.6% year on year and by 1.6% over the past three months. The average value in the city is $725,113. The Western Bay of Plenty market rose 4.8% year on year and 1.8% over the past three months. The average value in the district is now $652,132. It’s a continuation of recent trends for Christchurch City, with value growth remaining modest. Values are slightly up year on year and slightly decreased by 0.1% over the past three months. The average value in the city is now $495,089. Dunedin residential property values are continuing to rise and have increased 14.3% in the year to February and 4.0% over the past three months. The average value in the city is $449,023. The Dunedin – Taieri area experienced strong value growth, up 15.0% annually and 6.1% over the past quarter. QV Dunedin Senior Consultant David Paterson said, “There is still strong demand for properties up to $400,000, with multiple offers a common scenario. With such demand, offers are often above expected value levels and this can cause problems securing finance." Nelson residential property values rose 7.8% in the year to February and by 2.4% over the past quarter. The average value in the city is now $612,081. Meanwhile, values in the Tasman District have also continued to rise, up 5.9% year on year and 2.2% over the past three months. The average value in the Tasman district is now $598,945. Napier values rose 12.5% year on year and by 5.2% over the past three months. The average value in the city is now $549,207. Hastings values are also continuing to rise up 13.2% year on year and 9.9% over the past three months. The average value there is now $511,442. In the North Island, Hastings leads the way in quarterly value growth, up 9.9% followed by Ruapehu (8.3%) and Central Hawkes Bay (6.0%). In terms of annual growth, Kawerau leads the way, up 28.5%, followed by Wairoa (27.0%) and Ruapehu (21.3%). In the South Island, Southland lead the way in quarterly growth, up 7.1%, followed by Dunedin – Taieri (6.1%) and Dunedin – South (4.3%). Dunedin – Taieri leads the way in annual growth, up 15.0% followed by Dunedin – South (14.9%) and Dunedin (central), up 14.3%.